The nativity was getting on her nerves. Her Bible study group had been discussing the Christmas story with their pastor, and now everything about the little scene rubbed her wrong. Joseph and Mary and the baby were white, for one thing. Laine hadn't really thought about that the previous thirty-seven times she'd set the nativity up in her living room, but now she couldn't stop thinking about it. There'd been a documentary on Nazareth and the people who lived there when Jesus did. It had been really interesting to see how people lived back then, and how they lived now. Something had been bothering her the entire time she'd been watching it, though, and it wasn't until the program was nearly over that she figured out what it was. There were no blonde people. No blue eyes. No peaches-and-cream skin. The people she saw on the screen were dark skinned, with the kind of deep brown eyes that seemed bottomless, and they all had curly brown hair. It didn't seem like Jesus and his parents would be different, but Laine read her Bible over and over trying to find some kind of a description. There wasn't one, but Laine was almost certain they couldn't have had blonde hair and blue eyes if they were from that part of the world. Then there were the three wise men, or Magi, or whatever. Her nativity had them right there when little baby Jesus was, well, a baby. Except the pastor and her study group talked about how they didn't show up until the baby was old enough to walk. That was a problem. Plus, they were all white just like Mary and Joseph and the baby. And now that she thought of it, the frickin' shepherds were white, too. Even the sheep were fluffy white. Laine's breath came a little quicker as the anger over the revisionist history blatantly on display in her nativity swelled. "Mom, do you think dinner is going to be ready soon? The kids are getting antsy." 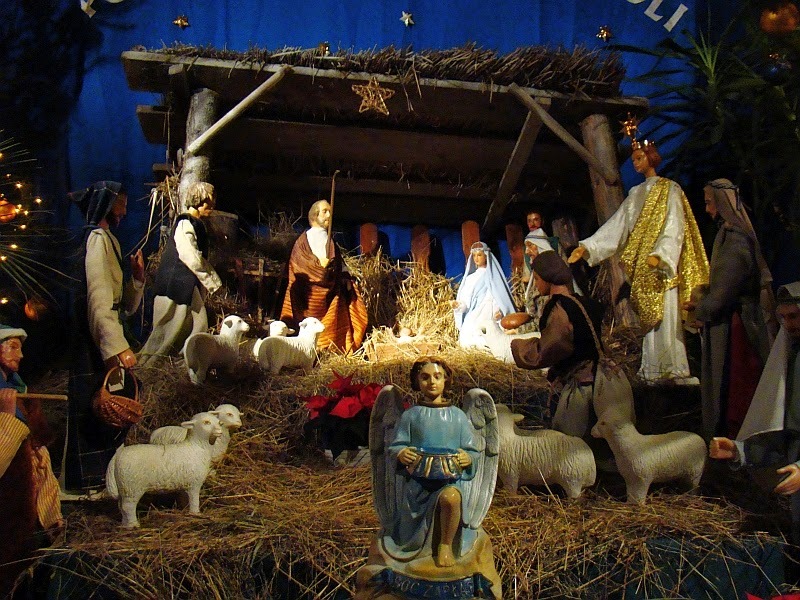 Her daughter's voice jolted her out of her preoccupation with the false nativity. "Oh, we're just waiting on the turkey. It shouldn't be much longer." Laine struggled to keep her voice even and her expression neutral until her daughter went back to the family room. Leaving the irritation of the dissonant nativity behind, she hurried into the kitchen to check the thermometer on the turkey. She'd only tried one of the birds that had the little pop-up thermometer in them once and it had been a disaster. The digital thermometer never failed, and it had the added bonus of an audible alarm that would let her know when the turkey was ready to be pulled out of the oven. The stubborn bird had taken a while, and unless a Christmas miracle occurred the family would be eating an hour later than she'd planned. Great. She peeked into the family room. All four of her grandchildren were in the room, along with her daughter and her husband, and her son and his wife. The only sound in the room was the television, which was blaring an animated Christmas special of some kind. No one was watching it. Every face was lit by the screen of whatever electronic device they were holding in their hands. Eight technological zombies, completely disengaged from the other people in the room. She couldn't tell if the kids were "antsy" or not, but since they'd neither moved nor blinked in the few moments she'd been watching them, she doubted it. The nativity flashed into her peripheral vision as she turned back into the kitchen, and the anger she'd forgotten came rushing back. Her steps took her toward the living room instead of the dining room and she crossed back to stand in front of the fragile display, her fists clenched at her waist. "Hey Mom, some kind of buzzer is going off in the kitchen, can't you hear it?" Her daughter was back in the doorway, irritation plain on her face. The sound of the thermometer's alarm penetrated the haze of anger that had enveloped her, and she shook her head to clear it. "How long has it been going off?" she asked as she rushed into the kitchen and grabbed her oven mitts. "I don't know. I didn't hear it until the TV went quiet for a minute. Does this mean dinner is finally ready?" Laine checked the thermometer and then slid the heavy roasting pan out of the oven and onto the quilted pads she'd put on the counter. "It needs to rest a bit while I warm up the rolls and the green bean casserole." Her daughter sighed heavily. "So it's not ready yet." Laine gripped the handles of the roaster tightly inside the oven mitts and took a couple of deep breaths. She was lucky to have her family with her at Christmas, she reminded herself. Lucky and happy, dammit. "Only about fifteen more minutes, hon. Why don't you have the kids wash their hands and get drinks poured?" A shrug and eye roll reminded Laine of Christmas's past, and not in a good way. She'd thought Brittany had grown out of the habit after her teens. Apparently not. "Scott, come help me carry everything to the table!" She raised her voice to be heard over the television. "Yeah, Mom. I'll be there in a sec!" That was just as familiar as Brittany's shrug and eye roll. Laine finished covering the turkey so it could rest and grabbed the potatoes and stuffing. She admired the poinsettias she'd embroidered on the white table cloth before she put the dishes down. It had taken a little over six months - it wasn't a skill she used often - but she was thrilled with how it turned out. Two more trips into the kitchen and back, and the glasses on the table were still empty and her son was still in the family room. "Brittany, dinner's about ready. Are the kids going to pour the drinks?" The television had been turned off, so at least she didn't have to yell her question over its noise. "Hang on Mom, they're getting to it." Laine took a page out of her daughter's book and rolled her eyes. It wasn't as satisfying as she thought it would be. Maybe it required an audience. "Scott, I've got the food on the table, can you get the turkey?" The long silence after her question almost had her asking again, but as she took a breath her son answered. She rolled her eyes again and added in an irritated mutter. "Just a sec, getting to it. 'When is dinner, we're hungry!' But not hungry enough to help get it on the table, obviously!" Laine took the aluminum foil off the turkey and slid the large meat forks under the bird to transfer it to the silver serving tray she had waiting. Her husband had loved carving the turkey at the table; when he'd passed five years ago, her son had taken over that job. He preferred carving it in the kitchen with an electric knife, so she plugged it into the outlet next to the sink. "Scott, the turkey's ready to carve," she called out, deliberately injecting holiday cheer into her voice. His voice drifted back from the family room. "Be right there, Mom." She started loading the dirty dishes that had accumulated through the afternoon into the dishwasher. Since her son still hadn't come in to carve the turkey when she was finished, she wiped down the counters and the fronts of the cupboards. Twenty minutes of cleaning later and her family was still in the family room, held captive by technology. Laine walked into the living room to stare at the chubby, blue-eyed baby in the little manger. Visions of smashing those porcelain cheeks against the fireplace hearth danced through her mind. She turned slowly, her mind suddenly as clear as the empty crystal glasses twinkling on the dining room table. The heavily burdened table was cleared of food, and the bowls and plates and platters carefully covered and put on the counter. The golden turkey was re-dressed in its coat of silver, and the electric knife unplugged. She heated some water in the electric kettle and fixed a hot cup of tea with plenty of sugar to go with a little plate of Christmas cookies. Leaving the kitchen with her cup and plate, she reached out and turned off the lights. The light switch in the dining room was next, dulling the shine of crystal and china still on the table. In the living room, Laine turned off all of the lights except the ones illuminating the Christmas tree and sat in her favorite chair. Pressing a few buttons on the remote had her favorite Christmas album playing as she enjoyed the way the twinkling lights lit up the holy family and their visitors. It was a beautiful nativity.